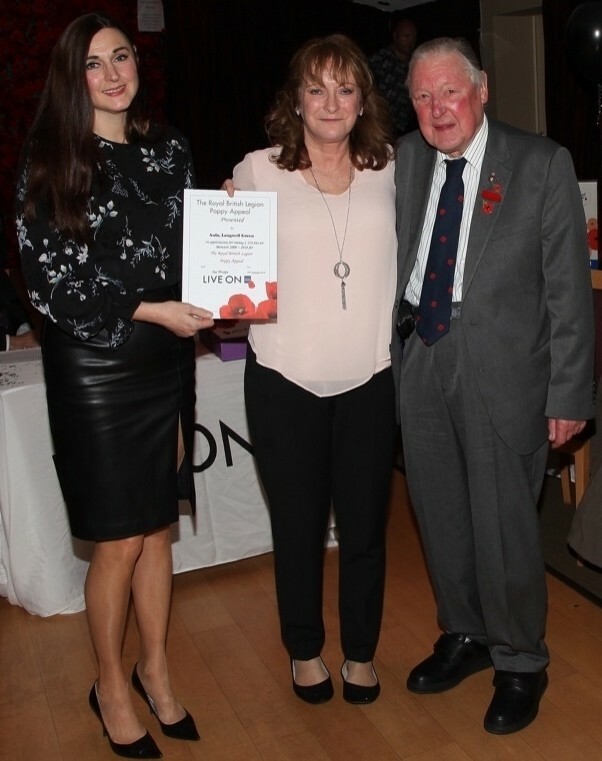 The Royal British Legion invited Susan Grant from our Longwell Green store in Bristol to a special awards evening to present her with a certificate thanking customers and colleagues for their support over the years. The annual Poppy Appeal collection at the store has raised a grand total of £219,661.64 for the Royal British Legion since 2000. Volunteers from the Bitton and Oldland branch are familiar faces at our Longwell Green store. A team of 40 volunteers including George Reynolds call in to sell poppies in the run-up to Remembrance Sunday, while the branch's brass band call in to play for customres to raise awareness and funds. George, who's 89, was a soldier in the Royal Warwickshire Regiment. He said: "The Asda customers are very generous at putting their hands in their pockets for us and we're very grateful for that. "We have a nucleus of around 40 volunteers who do a few hours each during the Poppy Appeal, and the brass band definitely attracts the attention of customers and helps us raise money." Susan, who's the store's community champion, said: "George is absolutely amazing. The customers here are incredibly generous and we were so proud to collect the award. It was a lovely evening."